In 1992, Stephen Bourgeois founded Membranix Coatings, a small dampproofing company in Kanata. Mr. Bourgeois incorporated the company in 1994. Since then, thanks to his dedication, motivation and true knowledge of the waterproofing industry, he has vastly expanded the company product line and services. Membranix Coatings is now a waterproofing, dampproofing and foundation restoration business undertaking more than 4000 new installs of various membranes a year. As a privately-owned Canadian company, Membranix Coatings prides itself in providing the highest level of service and workmanship for all projects. We take on both large and small projects that follow all waterproofing requirements to prevent or stop leaky basements. We have a crew of highly trained professionals equipped with additional resources available when required for larger projects on short-term or long-term notice. 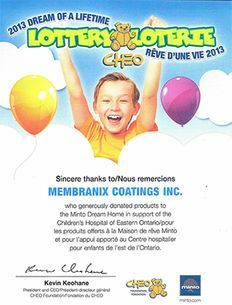 Sincere thanks to/Nous remercions MEMBRANIX COATINGS INC. who generously donated products to the Minto Dream Home in support of the Children's Hospital of Eastern Ontario/pour les produits offerts à la Maison de rêve Minto et pour I'appui apporté au Centre hospitalier pour enfants de I'est de l'Ontario. Membranix Coatings Inc. is a member in good standing of the OCA, BBB, GOHBA and CHBA. Contact us to find out more about our products and services.